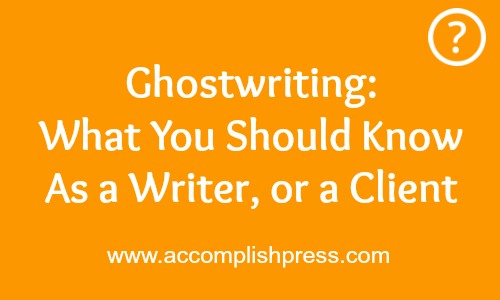 What exactly is Ghostwriting? How did you get into this niche? – In simplest terms, ghostwriting is when someone takes on the writing responsibility for another person. The author claims the credit, while the ghost does the writing. What are the skills you need to be a great Ghostwriter? – To be a ghostwriter, you need good research skills, interviewing skills in order to get information from the author, analytical skills in order to know what goes where, seeing that the work doesn’t come from the experience of the ghost, and most importantly and obviously, writing skills. What is the pay structure like? – There is no set pay structure. Every ghostwriter has their own payment structure, though it is usually more expensive than regular writing jobs because of the amount of work and time that goes into it, and also the fact that the ghost can claim no credit once the job is done. What rights do you have over the work? Is it different from other ‘write-to-hire’ jobs? – There are two types of rights when it comes to ghostwriting, as I have learnt, and all these reflect in the contract drawn between the author and the ghost. In the first one, the ghost is completely invisible, cannot reference and cannot be referenced. In the second one, the ghost is given credit as the one behind the book, and can add the title to his ‘list of past works’. The extents to which one can go and not go in claiming rights is usually stated in the contract. Do you have to sign a confidentiality clause when you take on the work? – It is safer for both parties to do so, although for the jobs I have done, I didn’t sign any clause because I am based in Nigeria. In cases like this and most of my editing jobs, I am very strict with my payment structure. No payment, and the book doesn’t get done. Who are the people most likely to be your clients? How do you find them? – Celebrities, pastors, busy people who want to write books, corporate organisations, etc. We don’t find them, they find us. Do you need to do a lot of research in your work for other people? – It depends. One thing evident in ghostwriting is the need for resources. The resources would either come from the author in form of interviews, documents, tapes, etc. or would come from research. If research is involved, it increases the cost of the service, as the ghostwriter has to be responsible for sourcing for information. Do you find it easier or harder to write for others as opposed to writing your own work? – This is not straightforward. I find it easier writing my own work in most case, especially since the information is in my head. In cases when the author presents you with all the materials you need, ghostwriting becomes easy because all you need to know is what goes where, and good writing skills. Do you write fiction or non-fiction for your clients? Which do you prefer? – All my ghostwriting works have been non-fiction, and I think that is the most popular one, because of the kind of people who hire ghostwriters in the first place. I don’t know if I would like ghostwriting fiction, but I would keep that option open. Do you find it easier to keep an emotional distance from the work? – Yes. I find it easy. It is strictly business, and what matters most for me is quality. There is no use being emotionally tied to what cannot be linked back to you. How do you feel when the work gets published and becomes successful, but you can’t claim any credit for it? – I don’t feel anyway. It doesn’t matter to me. I think I would feel bad if I didn’t get paid, and not about the credit, but I get paid else the client would not even see the book. How do you manage your client’s expectations? – I send weekly updates to my clients, whether it is ghostwriting or editing. I send them write ups enough for them to see that work is going on, but nothing they can use independent of me. Also, my client and I agree on a comprehensive timetable before the work even starts, so there are no surprises along the way. Any advice for writers who may be considering this niche? – Be disciplined with time, have a good payment policy, an eye for detail, and never let emotions get in the way.